So good they carved it twice? There are several instances of the same name featuring twice on the School Gateway. In many cases the inscription appears to have taken place at a different time, so we can perhaps assume that the action of having one’s name carved was meant as a marker of a specific event or achievement. 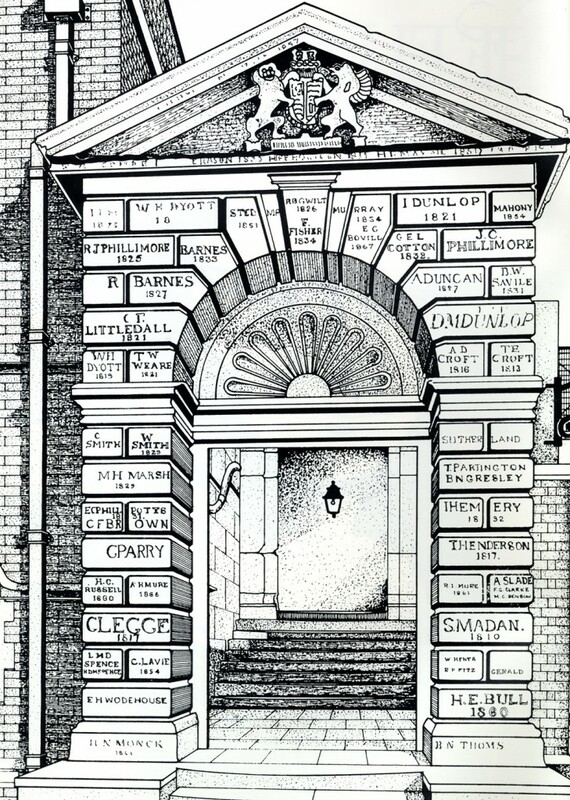 William Barnes’ name was carved on the south wall of the stairs in 1832 and on the front of the gateway in 1833. John George and Robert Joseph Phillimore both carved their names on the front (1824 and 1825 respectively) and the back of the gateway (1822 and 1827). Another factor might have been the location of the inscription – wanting to up-grade to a better spot or ensure, as in the case of the Phillimores, that your name was seen both going up and coming down from school. There is one curious exception to this pattern – that of W.H. Dyott. William Herrick Dyott (b. 1809) and his brother Richard (b. 1808) are interesting studies. The School Archive has copies of their extensive correspondence with their father, General William Dyott, who had served as aide-de-camp to George III and met Napoleon. The boys’ mother, Eleanor (née Thompson) eloped in 1814 and their father was eventually able to divorce her through an Act of Parliament (one of the few ways to legally end a marriage at that time). Despite being able to marry again he remained single until his death in 1847. General Dyott was far from the archetypal father of the period. He wrote regular, detailed and affectionate letters to both his sons, whose poor academic performance appears to have been something of a disappointment. The boys wrote back rather less regularly; William, known to the family as ‘Bill’, was a particularly poor correspondent. All three Dyotts were very much country squires and passages about the school often make way for comments about hunting: ‘I kill’d a hare yesterday as large as a greyhound in Black Slough which I have sent the good Lady’ and ‘will you be so good to send my gun…there are lots of rabbits about here, and it will not interfere with my studies’; queries concerning the family’s horses ‘I suppose you will ride your fine hunter the Champion at the coursing party and surprise them all with the leaps you will make’ and other remarks about the livestock. Although Richard sat ‘The Challenge’, the school’s Scholarship Examination, on several occasions, it was William who managed, on his first attempt in 1824, to pass the test. It is William’s name that features twice on the front of the School Gateway with both inscriptions bearing the same date of 1819. Is it possible that both brothers were meant to be represented and the stone mason made a mistake? Disappointingly, although the boys’ school accounts survive, including items such as ‘window mending’, ‘dyed jean breeches’ and a ‘case of mathematical instruments’, there is no mention of a stone mason being paid to carve names into the gateway. They each received a generous allowance from their father, so would easily have been able to raise the money needed for the work.